Next up in my recipe series showcasing the producers of Cahir Farmers Market is my sharing platter. This platter combines cheese and pates from Knockara, fish and seaweed from Hartley’s Sea Foods, bread from Ellen, apple cider vinegar from The Apple Farm, fresh greens from Jim & Keith’s garden and fresh vegetables from Pat O’Brien’s fields. Food for me is all about the people who created it, cared for it, picked it, produced it and those you share it with!! I prefer laid back dinners with a real family-style feel versus lots of perfectly plated creations for when I gather some friends or family together. This sharing platter combines lots of different ingredients all produced or cared for by the stallworth’s of Cahir Farmers Market. It’s the perfect mix of flavours for sharing and a great way to start any meal. It really will get the conversation flowing with lots of tasting and trying. Check out all the recipes in my Cahir Farmers Market series here. For the pate toasts: make some pickled onion by combining the onion, vinegar and sugar in a bowl and set aside. Cut the bread into small but thick slices. Melt the garlic butter on a frying pan over a medium heat. Once melted, add the bread and turn in the butter until coated on both sides. Cook until lightly toasted on both sides. Spread some pate onto the toasts and add the pickled onion to the top. For the salmon lettuce cups: separate the lettuce leaves and stuff each with grated carrot. Spread a generous teaspoon of the salmon pate on top and sprinkle some chive to finish. For the garlic prawns: in a mixing bowl, soften the garlic butter with the back of a spoon and stir through the prawns until well coated. Place a dry frying pan over a high heat and add the prawns. Cook for 2 minutes and turn over to cook through on the other side. For the creamy seafood dish: melt the garlic butter on a frying pan over a medium heat. Add the prawns and cook through. 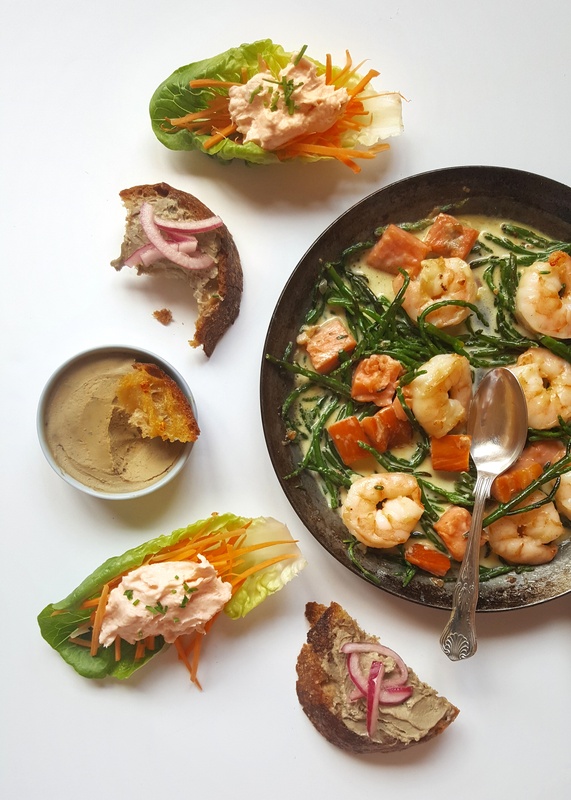 Stir in the smoked salmon and samphire, cook until the samphire lightly wilts. Pour over the cream, stir to combine and allow to bubble up for 2 minutes. Remove from heat and serve with some brown bread.